Tea or Milk Tea has long been more than just a cup of fresh, sweet drink. Coming to the Milk Tea, worries about unhealthy eating habits and unsafe health will now be solved. We bring you a new way of eating in a nutritious way. 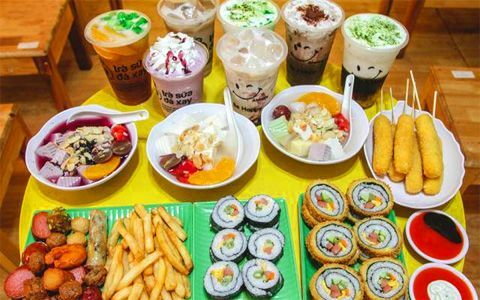 Come to Milk Tea bạn you will feel it all. At the O milk tea is located at 120 Ngo Gia Tu Street, Nha Trang, every corner with friendly design, drinks are treated with the best quality. Made great cups of milk tea. Along with the dedication of staff has created a place for you to share the joy with friends. There are many kinds of tea and snacks: Oolong tea, Peach tea, Matcha tea, Blueberry milkshake, Chocolate milkshake. Coffee is very delicious, Meat skewers, Chips, Fried shrimp, German sausage… A familiar destination of diners in the coastal city of Nha Trang. Tea or Milk Tea has long been more than just a cup of fresh, sweet drink. Topping up delicious but also a chance to meet and chat with friends.